As a KTA Race Centre we will be able to assist you in becoming a proficient racer. Our qualified race instructors can teach you everything you need to know to be able to compete in your first competition or enjoy the thrills of riding a race board by yourself. As racing equipment is very expensive we do not expect all of you to turn up with your own raceboard and kites. 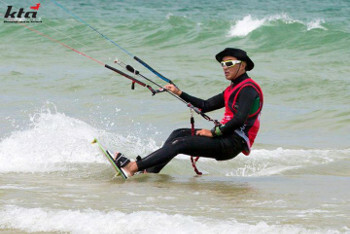 For this purpose we have several raceboards and kite available for rent and tuition. Please feel free to stop by our shop at the Asia Bay Resort in Boao, on Hainan Island to see our current range of race boards and race kites. You are welcome to lounge around on our patio and enjoy our fresh coffee or try one of our pizza’s. Atte at the World Championship Boao, China.